Youngstown, NY - Youngstown Volunteer Fire Company President Greg Robertson Sr. shows Old Fort Niagara Executive Director Robert Emerson, right, some of the features of a new Fire Trailer, a project, which has been underway for several years. 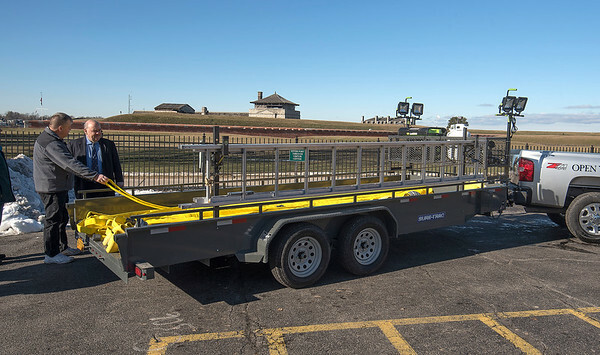 The trailer will fit through the Fort entryways and features 800 feet of hose, nozzles, ladders, lights and a generator that will already be onsite in the event of an emergency. (January 25, 2018) Youngstown, N.Y. – Representatives from the Old Fort Niagara Association, Youngstown Volunteer Fire Department, NYS Assembly, NYS Office of Parks, Recreation and Historic Preservation, and the Niagara County Legislature dedicated a new fire trailer at Old Fort Niagara this morning. The parties gathered in the parking lot near the fort’s visitor center to announce the completion of the project, which has been underway for several years. Members of the Youngstown Volunteer Fire Department and Niagara County Legislator Clyde Burmaster have been working with the fort to address a fire-fighting accessibility problem at the historic site due to its narrow entryways through the fort walls. The solution is a custom-built trailer, equipped with more than 1,000 feet of hoses, a dry hydrant, generator, nozzles, lights, tools and ladder, that can be pulled through the fort’s narrow gateway by a pickup truck. The setup allows fire-fighting personnel to access the fort in an emergency in a way they could not do before. Funding for the trailer was provided by a special grant through the NYS Assembly, announced by Assemblyman Mike Norris, and administered by the NYS Office of Parks, Recreation and Historic Preservation. “I am very proud to represent Old Fort Niagara, which is an historic treasure not only here in our community, but nationally as well,” said Mr. Norris during the dedication. “It is an honor for me to be present for the unveiling of the new fire trailer equipment that will protect and insure a valuable state asset, and was purchased with grant funding from the New York State Assembly. Thank you to the Youngstown Volunteer Fire Company for all of the efforts in the design and production of this equipment and continuing to keep our community safe." Old Fort Niagara ( http://www.oldfortniagara.org) is a Registered National Historic Landmark and New York State Historic Site operated by the Old Fort Niagara Association, a not-for-profit organization, in cooperation with the New York State Office of Parks, Recreation and Historic Preservation. The site is open daily from 9 a.m. to 5 p.m. Gates close 30 minutes after the last ticket sale. Follow us on Facebook, Instagram, Twitter and YouTube.